WildArk is an incredible conservation organisation with a mission to inspire people to connect with nature and to protect the world’s biodiversity. 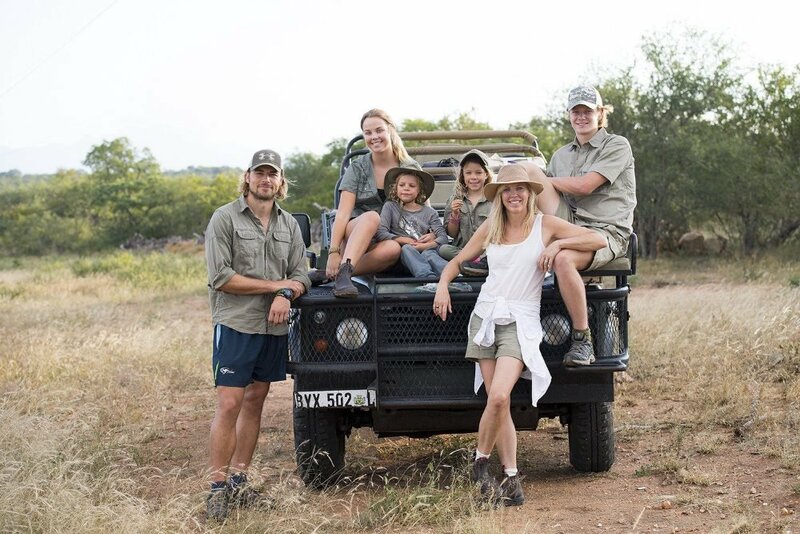 Sydney entrepreneurs Mark and Sophie Hutchinson set up the organisation just earlier this year, relocating to South Africa with their four children. They have already successfully set up their first project Pridelands, turning an old hunting farm into a wildlife conservancy with the local community. Below co-founder Sophie shares their story, future projects, and advice for us city folk on how to re-connect with nature. COULD YOU GIVE US YOUR PERSONAL BACKSTORY AND HOW YOU ENDED SETTING UP WILDARK? I grew up in Sydney as one of 3, with a brother and a sister. As a family, we loved the outdoors. Mum and Dad’s love of nature and naturally beautiful places was a gift to my siblings and I.
Hutch (Mark) and I have always shared a love of nature, adventure and the outdoors. Our adventure and travel business, Untamed Tracks, took us to remote places around the world. WildArk is the result of a culmination of years spent living and working in wilderness areas. We felt a deep sense of responsibility and urgency to do our piece to protect wild places, as best we could so that they would be around for future generations to enjoy. We have really been working towards the creation of WildArk for many years based on all these experiences. WHAT WAS MOMENT THAT KICK-STARTED WILDARK FOR YOU & YOUR FIRST STEPS? There was something about the morning we spent watching a beautiful female black rhino and her calf grazing peacefully in the wild, knowing what we were witnessing was a scene that may not be around for much longer. It kicked us into gear quickly and we set up WildArk immediately on our return to Australia. The mission was clear and we knew it was time, so we set to work. Finding out about the deaths of these two rhinos months later was terribly heartbreaking and tragically is now an all too common story. We wanted to concentrate our efforts on securing as much space as possible for the wild, as we believe if wildlife is to stand a chance, the key is to safeguard wilderness areas and ensure long-term biodiversity protection. We began our search for our first piece of land, somewhere that we could convert into a conservancy. We were very lucky to find such an incredible block that bordered the Greater Kruger in South Africa. We could see the potential and together with our local South African partners, John and Anton Lategan, we purchased the former buffalo hunting farm. We named this conservancy Pridelands and set to work for the majority of 2017 on restoring the property with the aim to drop fences to the Greater Kruger region and allow the free movement of wildlife through this natural corridor. We relocated our entire family to Hoedspruit to work directly on the property. HOW DID SECURE THE LAND AND INCORPORATE THE COMMUNITIES THAT LIVE AROUND THEM? Pridelands is an excellent example of how an area of land can be put aside for wilderness, whilst also providing benefit for the local community. To date, we have employed 7 local people to work on it and this number will grow as our Ecotourism operations are underway. Importantly, we also want to develop community initiatives that provide the opportunity to experience and learn about wildlife and help nurture a positive connection. The human/wildlife conflict is present in areas like this all around the world and bridging that gap through education, employment, engagement and working out ways one can benefit the other in a healthy way is a key part of keeping these areas protected in the long term. WHAT ARE THE NEXT STEPS FOR WILDARK’S CONSERVATION PROJECTS? The achievements on Pridelands have only strengthened our resolve to see this happen around the world. So with great local partners in Pridelands, we are now able to take another step towards this goal and have moved our family to Colorado. With our head office and CEO, John Hardman based in Atlanta, it makes sense for us to be here. We have 2 new proposals on the table one of which is in Alaska and the other in Papua New Guinea. They are both land and community-based projects that are close to our hearts. We will be back and forward from Africa regularly and are excited about the many plans we have for Pridelands in 2018 and beyond. COULD YOU TALK US THROUGH YOUR SCIENCE-BASED PROJECT WILDARK 100 WITH MACQUARIE UNIVERSITY? The WildArk100 works on the principle that by protecting the 100 most charismatic animal species in the world and their home ranges, we are able to provide protection to all other living things in these areas. Hutch is currently completing his Masters in Conservation at Macquarie University and through this connection we have joined forces with Macquarie University and the talented American conservation scientist, Jennifer McGowan, to create this scientifically researched list. We are very excited about this as it provides a whole new approach to conservation and will assist in the prioritization of our future projects. The benefit of the WildArk100 is that it makes what can be perceived, as an overwhelming problem seems less so. We don’t have to try to convince people to care about, love and support the WildArk100 as many of the species on the list are known and loved already. WHAT ARE SOME OF THE LESSONS AND HIGHLIGHTS YOU’VE HAD ON YOUR WILDARK JOURNEY SO FAR? Without a doubt, cutting the wire on our fence and watching the animals move onto Pridelands is at the top of my list of moments so far. In addition, it has also been incredible to share these experiences with family, friends, work colleagues and our ambassadors. We are now looking forward to being able to open the gates for safaris and educational experiences to share Pridelands with all those who visit. We have learnt along the way that negotiations take their time as do the preparations necessary for a property to be ready to be open to wildlife. Our big challenge is security with the intense threat of poaching. Ensuring we can make Pridelands as safe as possible is our main priority. We have been learning on the job and we have had the benefit of lots of local people who know the area intimately. Your four kids must have such incredible experiences growing up in a wildlife reserve. What advice would you give to parents or individuals who want to be connected to nature and animals whilst still remaining in the cities? It has always been very important to Hutch and I to give our kids as many experiences in nature as possible. We want them to enjoy it, feel comfortable in it, be knowledgeable about it and respect it. I think the outside play is crucial to their development and their freedom as a child. It helps them expand their imaginations, builds confidence and gives them space to just be kids. Watching them play and explore in nature actually reminds me how to keep looking at the details. YOU HAVE INCREDIBLE AMBASSADORS LIKE SURFER MICK FANNING, HOW DID YOU GET THEM ON BOARD AND WHAT IS THEIR INVOLVEMENT? We have been so blessed with our WildArk Ambassadors. All incredible people in their own right. They all bring to WildArk enthusiasm and a genuine love of the wild with a deep-seated desire to see it protected for the future. When we approached each of them individually, we received such wonderful responses of enthusiasm, optimism and eagerness to be part of the WildArk mission. We are so appreciative of their support and commitment. They all just want to do whatever they can to help. WHAT WOULD YOU RECOMMEND FOR PEOPLE SUCH AS MYSELF LIVING IN THE CITY WITH A FULL TIME JOB, TO HELP CONSERVATION EFFORTS? We have been so inspired and heartened by the expressions of interest we have received from people from around the world who want to help. We are currently in the process of developing ways for people to get involved in a meaningful way. We are keen to harness this enthusiasm and give people avenues to help both on the ground and from wherever you live whether you have access to wilderness areas or not. We also encourage people to look for educational opportunities in conservation areas. We are steering people in the direction of EcoTraining courses that are on offer on our website to help build this reconnection with nature. We also have plans to develop a WildArk Science and Media hub on our current and future conservancies as we grow and expand. We will open the doors to people from the science community and those interested in learning filmmaking and photographic skills in wilderness areas. A large element of our approach at WildArk is to share positive news stories about the wild to help people to connect with nature and to feel inspired to be involved in solutions. Not just seeing the negative, which can be easy to do especially when there are so many negative stories out there.